'I had been commissioned to go anywhere in the world I wished and write whatever pleased me. 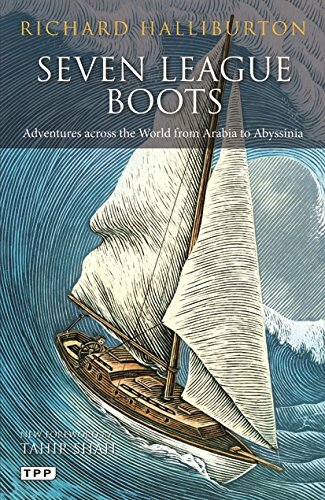 My only orders were to move fast, visit strange places, to meet whomever was interesting - and to start at once,' Richard Halliburton's fifth and last book, Seven League boots illustrates how he followed these orders with passion and abandon. America's favorite adventurer dined with Haile Selassie and rode the Rhinoceros Express in Ethiopia; he had an audience with King Ibn Saud outside the gates of Mecca (which he had tried to sneak into) and finally rode an elephant over the Alps in the tracks of another great adventurer, Hannibal. This is Halliburton at his best: reckless and romantic. It is also the last chapter of a life that had, at its end, grown tragic. Nearing forty, physically exhausted, and in financial trouble, Halliburton thought to roll the dice once again, hoping that the charm which had always saved him in the past would materialize one more time. But it was not to be. His last journey was fatal. Soon after finishing this book, he attempted to sail a junk across the Pacific, but never returned. Verlag: I.B.Tauris & Co. Ltd.